Easter can be a hoppin' good time for the family with all these egg-cellent activities around the Lower Mainland, listed by municipality. Your local community centre may also offer Easter-themed fun - check with yours. Happy Easter everyone. For children ages 3 to 8 years. Join us for a morning of Eggciting activities and action! Rain or shine, the outdoor egg hunt, is a search for bright and colourful eggs, big and small. The Easter bunny will be joining us. Cost: $5.00. Come for some Easter Egg Hunt fun! Includes arts & crafts activities and a visit from the Easter Bunny! Pre-registration required, drop-ins permitted ONLY if space is available. The event will also include an egg hunt with a candy bag to take home. No need to bring a basket, this will be part of our arts & crafts activities. Parent's supervision is required for 1-3yrs session. Cost: $5 per child. The Cadillac of Easter events! Ages 10 years & under. You can bring your own basket, or make one the day before (at Westbrook Welcome Centre on March 21 & 22, 3:30 pm – 5:30 pm). Come to Hillcrest for some Easter family fun! Children and adults will have fun making Easter crafts, decorating cookies/cupcakes, playing carnival games and winning fun prizes! Kids will have fun going on an egg hunt and taking home special treat bags! Great photo opportunities with the Easter Bunny. Cost: $3.00. Hop on by for a fun-filled day including a ride on the miniature train, egg hunts, crafts and a visit from the Easter Bunny. The train runs rain or shine and is fully covered, protecting everyone onboard from spring showers. Be sure to bring your own Easter basket for the egg hunt! Hop in and meet the Easter Bunny. Outside Egg Hunt and lots of indoor activities too! Parent participation required. Pre-registration encouraged. Cost: $6 per child. HOP on down to our annual Easter Event at Sunset. Activities will include a bouncy castle, arts and crafts, face painting, cookie decorating and an Easter egg hunt. Breakfast will be served by our wonderful group of youth volunteers. Register now as this event is surely going to sell out. Cost: $5 per child. Join your neighbours and get to know your local merchants. Hunt for clues that will let you know more about Cambie Village, Vancouver, and your neighbourhood. Your completed Map of Clues will earn you an Easter treat. The event is suitable for youth and adults. Younger children will require help from older siblings and parents. This popular annual event brings families and the Easter Bunny together to have a FUN-tastic time! The event will feature a bouncy castle, Easter themed arts & crafts, face-painting, and so much more! The Easter Egg Hunt portion of the event will take place both indoors and outdoors (weather-permitting). All participants are guaranteed to take home a prize! Please bring a non-perishable food donation to support the Greater Vancouver Food Bank Society. Adult participation is required for 2-4 yrs session. Drop-ins not permitted. EGGstra fun is in store at our annual Easter event, which includes a continental style brunch, games, crafts, family entertainment and an Easter Egg Hunt. Space is limited and registration must be done in advance. Children must be accompanied by an adult. This event is suited for children 2-8 years. Cost: $5.00 per child. from 11:00 am – 3:00 pm. Photos are $5 each by Mandarin 1HR Photo. Join your neighbours and friends from the Kensington Community for Breakfast with Bunny. There will be a pancake breakfast, arts and crafts, entertainment and a visit from the Easter Bunny. Please register early for this event. Cost: Members $6.00, Non-members $7.00. Join for a FREE and “eggciting” Easter event at the River District! There will be chocolate egg hunts, a bag decorating station, face-painting and prize draws! Pre-registration is required to participate by March 25. Easter activities for kids include face painting (small fee), balloons, an Easter craft, and a visit from the Easter Bunny! This year's Easter festivities will feature delicious brunch classics for all ages and an exciting Easter Egg hunt led by the Easter Bunny himself. Cost: Adults $42, Child (5 - 12 years) $15, Tots (4 & under) Free when accompanied by an adult. Reservations limited. There will be a number of great Easter activities taking place at Maplewood Farm. Anyone who finds a hidden egg around the farm and turns it into the Greenhouse will get a goody bag! The Easter Bunny will also be dropping by to hand out chocolate. Special admission rates apply. Hop on down to John Lawson Park and join in the Lions Club kids Easter egg hunt. Have fun hunting for eggs while learning about fishing on the West Coast. 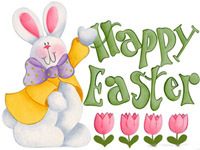 Enjoy Easter themed arts, crafts and activities. Enter the annual prize draw for a chance to win a chocolate Easter bunny.